Servers, routers, and other electronic equipment sometimes 'lock-up', often requiring a service call to a remote site just to flip the power switch to perform a simple reboot. The RE.99 Series Remote Power Switches give you the ability to remote reboot and remote power cycle equipment from anywhere. 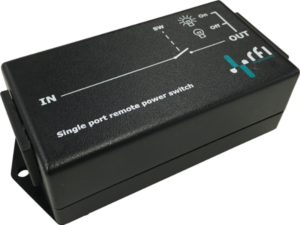 The RE.99.R1NC is a remote power switch that can be used to remotely control the power to an external device, such as network routers. The unit supports universal IEC320-C14 type input and IEC320-C13 output connectors to easily fit between the power cord and the device under control. The RE.99.R1NC has a contact relay that is normally closed (specify RE.99.R1NO for normally open). The maximum switched current is 6A. A typical application for the power switch is to remotely reboot a network router.